To ensure the safety of your belongings, you MUST change the factory set User Codes to your own unique codes immediately! 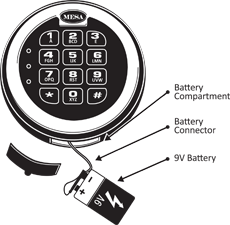 If three invalid codes are entered in a row, the keypad will shut down for a period of fifteen (15) minutes. During this shut down period the keypad will not accept any codes. Two User Codes can be programmed up to eight (8) digits long. Please change both codes immediately for your safety. Please see your user manual for the factory set User Codes or contact Tech Support. Test the new codes several times before closing the door. Red light appears when you open the safe other than the green light. Enter your code and get valid response but the lock doesn't unlock. 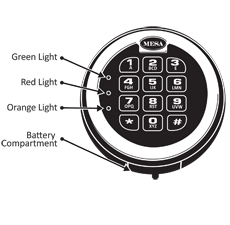 Locate the battery cover on the bottom edge of the keypad and remove the cover by pulling on the tab. Carefully reinsert the new 9V alkaline battery, do not force the battery into the compartment. 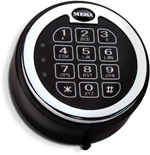 The lock will retain all current codes and settings.